Need some marketing and social media strategy inspiration as the World Cup approaches? If so, take a look back at what Listerine did in 2014. The brand’s first World Cup sponsorship literally had mouthwash maker making headlines. To play off the social media buzz spiked by the soccer matches, the Johnson & Johnson brand set up newsrooms in New York and London to post real-time reactions to the tournament action on Facebook and Twitter. The play-by-play came from sports experts and graphic artists who transformed sports commentary into social-friendly posts. Listerine also turned the most engaging pieces into ads on Twitter and Facebook in both mobile and desktop versions. Since the World Cup plays to a global crowd, Listerine overcome language barriers by translating its tweets into English and Spanish, and it also converted its Facebook posts into Italian, Arabic, and Portuguese. “We commissioned illustrations of facial reactions paired with “pun-tastic” headlines borrowed from the tabloid style of global sports newspapers. Using predictive content planning, within minutes of any big play, Uruguayan biter or final whistle, we had the story ready to share on Facebook and Twitter. In addition to the social media effort, the mouthwash maker also ran a TV ad, set up in-store promotions, and placed signage around the stadiums. It was truly a multi-channel campaign as well as a breath of fresh air in the World Cup marketing game. Discover the secrets of successful social media. Contact MDG Advertising today at 561-338-7797 or visit mdgadvertising.com. 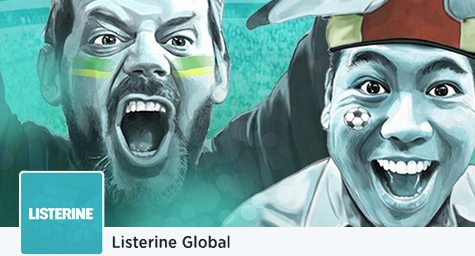 Listerine’s first World Cup sponsorship has the mouthwash maker literally making headlines. To play off the social media buzz spiked by the soccer matches, the Johnson & Johnson brand has set up newsrooms in New York and London to post real-time reactions to the tournament action on Facebook and Twitter. The play-by-play comes from sports experts and graphic artists who are turning their sports commentary into social comments. Then, Listerine is turning their most engaging posts and tweets into ads on Twitter and Facebook in both mobile and desktop versions. Adweek.com featured more on this fresh social media effort that is guaranteed to make news. Listerine has already kicked it with this “Power to Your Mouth” campaign by opening its first global Twitter account for the effort. Each social media post features game highlights in the form of headlines. Posts also include illustrations that should read very well with mobile viewers and play into Twitter’s goal to get more multimedia into its tweets. Since the World Cup plays to a global crowd, Listerine is overcoming language barriers by translating its tweets into English and Spanish, while converting its Facebook posts into Italian, Arabic, and Portuguese. In addition to this social media effort, the mouthwash maker is also running a TV ad, has set up in-store promotions, and placed signage around the stadium. This is Listerine’s first World Cup sponsorship and their newsworthy social media efforts are certainly a breath of fresh air in the branding and marketing game.